My daughter will soon be 8. We have a great relationship and are very close. She is having difficulty at school. Sometimes with her friends she is like a different person to how she is at home, she becomes very bossy and sometimes possessive of her best friends. Unfortunately it is making some of the other girls dislike her and leave her out, not inviting her to parties etc. I don’t know how to deal with the situation and how to stand back in a positive light rather than feeling like I want to tell these kids off for being so mean. It’s a difficult situation as really she is being over enthusiastic and I feel misinterpreted. I don’t have any problems at home and the flip side is that my laid back 6-year-old girl is Miss popular in her class. Help how can I help her to be liked? Hi Vanessa, One of the most difficult things for mothers to do is just step back and allow children to learn from their experiences. But it is usually the most effective. You might find the following excerpt from Positive Discipline A-Z helpful. We often forget to honor the different styles and personalities of our children and try to make them all fit one mold. This tendency can be most blatant when it comes to the secret dream of most parents--to have popular children. Some children are quiet and passive, some are active and assertive, some choose conventional lifestyles, and some choose unique lifestyles. The following suggestions focus on meeting the true needs of the situation--to help your children honor the uniqueness of each individual and feel comfortable with who they are. Allow your children to choose their own friends, but help your kids have contact with others their age by signing them up for after school activities and driving them to sleep-overs and play dates. When your kids are young, arrange play dates for them at your house, too. If your child chooses a friend you don’t like, invite that person into your home often and hope that the love and values you practice will be beneficial to him or her. If you are afraid a friend you don't approve of will have a negative influence on your child, focus on being a positive influence through a good relationship with your child. It is okay to express your concerns as long as you are sharing ideas and not giving orders. Don’t worry about whether your child has the right number of friends. Some prefer just one best friend; some like to be part of a large group of friends. If your child complains that he or she has no friends, practice your listening skills. Try rephrasing your child’s complaint using feeling words, such as, “You’re pretty upset right now because you don’t think you have any friends. Did something happen today between you and your friends at school?” Often children will catastrophize and speak in absolutes, when what they are really trying to say is that they are having a problem with one of their friends. Be a good listener to help your child think through the situation out loud. Help children who have difficulty making friends by exposing them to many opportunities, such as trips to the park, Scouts or other youth groups, and church groups. Do not expect your children to enjoy the children of your friends or insist that they play together if your kids don’t enjoy their company. Find time to spend with your friends without subjecting your children to feeling stuck having to play with kids they don’t like or with whom they don’t have anything in common. Go along with your child’s wishes about clothing styles so he/she won’t be embarrassed about not fitting in. Make your home a place where kids love to come because they experience unconditional love, safe and respectful rules, and plenty of fun, child-oriented activities. If you have issues about having enough friends yourself, don’t worry about your child having the same problem or project your experience onto your child. Be careful not to put your judgments about friendships on to your children. You may think friends are forever while your child may enjoy moving in and out of different groups of friends. Be a good observer and see how your child handles friendships. Children don’t like to bring friends home when one or more of their parents is chemically dependent, because they are embarrassed and fear what they might walk into with their friend. If someone in your family suffers from chemical dependence, get help, because your children will be missing out on a lot if they are afraid to bring friends home. Children can learn that their parents are their best friends because they love them unconditionally, value their uniqueness, and have faith in them to choose friends that are right for them. Their friends can feel safe around their parents because they offer guidance without lectures and judgments. If your child is consistently choosing friends of whom you do not approve, look at your relationship with your child. Are you being too controlling and inviting her to prove you can’t control everything? Is your child feeling hurt by your criticism and lack of faith in her and trying to hurt back by choosing friends you don’t like? Have faith in your children and honor who they are. Try to make the people your children choose as friends welcome at your home, even if they are not the friends you would choose. Your children may be making decisions about friends based on how you treat your friends. Are you acting how you would like your children to act? Sometimes teens think their lives are over if they don’t have a friend. Often we overemphasize the importance of having friends, so that children who choose to be alone feel uncomfortable with that choice, because they “should have friends,” rather than learning to be a friend to themselves. 1) Anxiety: in me & her Kindergarten Brother - every morning we walk to school as a family, she snuck out the back door and headed to school. Meanwhile, my son and I were calling around the house, and looking around our property for her. We walked to school hoping that she would be there. My son was worried that Madison would be afraid if we're at school and she was still home. I knew she would be there, but in the back of my mind I did have worry about her safety. 2) Defiance: I believe part of her sneaking out without saying anything was an act of defiance. Earlier she had hit her brother and taken his Pokemon cards away. I had previously told her not to touch his cards while they were getting ready for school - we have a rule about no playing with toys while getting ready or they get taken away and put in my room. After the incident I asked her to give me her Pokemon cards - which she said were lost. I then asked her to think about what else of hers I could hold on to until she figures out how to stop hitting her brother and playing with cards while getting ready. I was thinking that one angle might be to talk to her about what it means to be in the family, including the privileges; pack up some of her "things", and give her the opportunity to act like a part of the family and earn her things back. A new theme of Positive Discipline is "Connection before Correction." The first thing you need to do is make a connection with your daughter. There are several ways to do this. Make sure the message of love gets through: Honey, I really love you and I need your help to figure out how to solve this problem. Validate her feelings: Sweetie, I'm wondering if you are feeling angry about what happened this morning? I wonder if it hurt your feelings when I yelled at you and you wanted to hurt me back by leaving without telling me. Name what is going on and take responsibility for your part: I think we are in a power struggle or a revenge cycle and I'm wondering what I have done to create this. Maybe I'm being too bossy and focusing on punishment instead of having faith in you to work out solutions. Okay, you may be wondering, after the connection--then what? After a connection has been made, children (and adults) exit their mid brain mentality (fight or flight) and enter their rational minds where positive learning can take place. During this time you can focus on a solution instead of a punishment (even if it is called appropriate disciplinary action): Honey, I really would like to hear your version of what happened this morning. I saw you hitting your brother and I'm wondering, and I'm wondering what happened before that. This is where it is important for you to just listen. Don't interrupt and give your explain your point of view. Don't tell her she shouldn't think of feel this way. Just listen and then validate her feelings. Then you can ask, "Would you be willing to hear what happened for me and why I was so upset?" Children will listen to you AFTER they feel listened too--so long as you don't get into the lecture mode that include blame and shame. This could be followed by focusing on solutions where both of you can figure out what will work. You might ask if she would like to brainstorm together for solutions right now, or put the problem on the family meeting agenda where the whole family can brainstorm for solutions. First let me teach you about some preventative methods. If she is feeling defiant, are you willing to take a look at your part in creating that defiance? It sounds to me like you are talking too much. You do a lot of telling instead of asking. Please look at the two lists below and decide which one might invite defiance if you were a child, and which one might invite cooperation and the opportunity for you to feel capable and responsible? Stop fighting with your brother. Put your dishes in the dishwasher. Hurry up and get dressed or you'll miss the bus. 1. What do you need to do so your teeth will be squeaky clean? 2. What do you need to take so you will be warm outside? 6. What do you need to do with your dishes when you have finished eating? 7. What do you need to do so you catch the bus on time? I hope you did find Positive Discipline A-Z so you can look up "Fighting" for many more ideas on how to deal with sibling rivalry. Please keep one thing in mind. You don't know what your son may have done to provoke your daughter. By taking sides you engage in victim/bully training. You son gets to feel loved by being the victim (and will master this role and learn more ways to provoke so he can get sympathy) and your daughter gets to feel like a defiant bully (and will master this role). Instead, try using the words "kids" or "children." "I have faith in you kids that you can work out this problem. Let me know when you have found a solution." I hope you will start having regular family meetings so your children can learn many valuable social and life skills that will help them develop a sense that they are capable and have a lot to contribute with their good ideas for solving problems. My 4-year old recently started kindergarten and has to wear a school uniform. I tried to prepare her as much as I could over the summer about having to wear it for school. Thankfully we haven’t encountered any major issues in the morning when she has to put it on. A couple of weeks ago however, we found out that the kids are going to be doing Judo once a week, and last week they were given their Judo uniforms, and the parents were asked to send the kids to school every Wed in the Judo uniform and pack their school uniform in the backpacks. Again, we talked about it, tried it on, and she seemed to be fine with the idea. Well, this week when she had to put on her Judo uniform in the morning, the drama began. She REFUSED to wear it, so trying to give her a choice, I said she could either put it on and participate with her classmates, or she could put her school uniform instead, but she wouldn’t be able to participate, but that it was her choice. Well needless to say she wanted the best of both worlds. She wanted to wear her school uniform, and still be able to do her Judo class. I always feel like I’m walking that fine line between giving her choices (within limits) and adhering to certain policies (such as school policies). Also, these struggles ALWAYS happen when I’m racing against the clock to get to work in the morning, so more times than not, my patience inevitable runs out. I need some advice. How could I have handled this? Any suggestions on dealing with these power struggles would be GREATLY appreciated! When you give a choice you need to be okay with either choice and follow-through. Allow her to experience the consequences of her choice at school. When she cries and complains, simply validate her feelings. "I can see how upsetting that was." Then allow her to learn from the experience and decide what she will do next time without any lectures (especially in the “I told you so,” form from you. You do offer another clue when you say these things happen when you are racing. One possible way to prevent the problem in the first place is to have her create a bedtime routine chart that includes laying out her clothes for the next morning. Is is fun for the kids to have pictures of themselves doing each task. Pictures for the "Laying out clothes for morning" could include one in her regular uniform and one in her Judo uniform. All you would need to ask is, "Since tomorrow is Wed, which uniform do you need to lay out tonight. I'm sure you can see that helping her create her own bedtime routine with pictures helps her feel capable and allows her to use her power in useful ways so she doesn't feel the need to use it in "power struggles." I love your books! They have taught me so much about parenting in a non putative way, very different from the way I was raised. I have two daughters 12 and 14, and my husband has two sons 11 and 15. He has an authoritarian mindset when it comes to discipline, and I am using the Positive Discipline techniques I learned from you. My daughters are used to the positive approaches I use, and when we blended they were shocked and resentful of their stepfather's approach. I have shown him your book and he agrees with some things, but other things he thinks are ridiculous, that they are too permissive and lets children do what they want. I have expressed my concerns with his approach with my daughters but he feels he should not have to change. I then resorted to asking him to just back off from disciplining my daughters because I am uncomfortable with his methods, and that I would handle the disciplining of the girls, and he refused. I am getting no where. Any thoughts? I tried to find your book, Positive Discipline for Blended Families, but couldn't find it anywhere. Where can I get a copy? It is a common mistake for some to believe that Positive Discipline is permissive. In fact, many parents who are so against punishment may become permissive. However, I believe that permissiveness could be even more harmful to kids than punishment. Permissiveness creates weakness in children. They don't develop beliefs in their own capability and resiliency. They develop attitudes of entitlement and are very unpleasant to be around. They seem to think the world "owes them." They don't learn important social and life skills for self-discipline, responsibility, cooperation, respect for others, and problem-solving skills. So, I can certainly understand your husbands reluctance to go the permissive route. I'm not sure how to convince him that Positive Discipline is not permissive. Julie it might help if he understood that kindness and firmness are equally important in Positive Discipline. It might help if he understood that punishment is designed to make kids "pay" for what they have done, while Positive Discipline is designed to help children "learn" from what they have done by focusing on solutions. Positive Discipline helps children learn to use their power in "useful" ways through family meetings, choices, and focusing on solutions, so they don't use their power to rebel. Most parents don't realize that even though punishment works short term to stop misbehavior, it has damaging long-term results in that children are left with a sense of doubt and shame or resentment and revenge. Parents don't understand that brain and how much more effective it is to wait until everyone has had time to calm down before discussing a problem. They don't understand how important it is to create a "connection before correction." Many research studies have shown that a sense of connection is the number one predictor of "good" behavior. 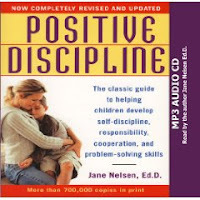 One other thing we point out in Positive Discipline for Step Families, is that both parents can feel comfortable engaging in discipline (not just the birth parent), when the discipline they use is kind and firm at the same time with a focus on teaching valuable social and life skills while helping children feel capable with the sense of self work in tact. When is a Child Old Enough to Choose? Hi Dr. Nelsen,We seem to be having morning issues with my three-year-old daughter. She wanted to wear a dress this morning even though it was a little chilly out. My husband put pants and a shirt on her and she was practically convulsing on the floor in anger. Do you think a three year old should be able to choose her clothes for the day? Thanks for any help that you can offer. Oh my goodness, you are going to be in big trouble if you don't start letting her use her personal power in useful ways—unless you enjoy power struggles. Sounds like you are making the mistake many parents make in the name of love—over parenting. Have you thought about what you want for your daughter? Do you want her to feel capable? Do you want her to develop life skills? Do you want her to be responsible? Do you want her to learn problem-solving skills? What does she learn when you choose her clothes? That she is not capable; she isn't responsible--you are; she can't learn problem-solving skills. If she gets cold, I'll bet she can figure out how to solve that problem--if you let her. It would not be effective to tell her what to do, but to ask her what she thinks she could do to solve the problem. By asking curiosity questions, you provide her with the opportunity to think, to figure it out, and to feel capable. Let me give you a few more examples of how curiosity questions could help your child feel capable and develop problem-solving skills. You could ask, "What will happen if you are wearing a dress and it is cold?" What can you do if you want to be warm?" Suppose she still wants to wear a dress and does get cold? This is not the time for the "I told you so," lecture. It is time for validation and faith in her. When she complains about being cold you can respond, "I'll bet you are, and I'll bet you can figure out why and what you need to do to solve that problem." 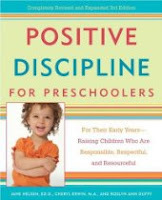 I hope you will read Positive Discipline for Preschoolers for many more ideas on how to help your daughter use her power in useful ways and to help her develop a sense of her own capability and other valuable social and life skills for good character. Today I feel the need to post another single parenting topic. That of multi-tasking! You've probably heard the saying that "Parenting is a two person job". No it's NOT...parenting is a six person job with lousy pay! So when tackling this project as a single parent, you're only option is multi-tasking! I've spoken to many parents and we all agree that laundry is one of the all-time most frustrating tasks. Laundry has a mind of its own. Even as I type this I've got a load of laundry in the dryer and another in the washer. I have three kids in this household and one adult with a very limited wardrobe...and yet the laundry keeps coming!!! But let's face it...as Bill Cosby so accurately put it "Kid's have brain damage!" Case in point: Clean clothes show up in the dirty clothes hamper! Huh? How does that happen? I've observed this phenomenon in action and the only explanation is "Brain Damage". I've watched my son go to pick out a shirt for the day. He grabs one off the shelf and two more fall to the floor. Then I tell him that it's time to clean his room and he picks up those two "clean" shirts and throws them in the dirty clothes hamper! Arggghhh!!! You might be thinking to yourself...just let the kids do the laundry. We actually have that system in place. Our chore wheel gives each child the opportunity to do the laundry for a week. But you don't really think that happens without supervision from Dad? There have been times when I've had to be somewhere else and the laundry was done without my supervision. And of course I come home to wet laundry in the washer that needs to be re-washed because it has been sitting there all day and is starting to smell or wrinkled clothes in the dryer that needs to be re-washed or ironed. And laundry is just one of the many tasks that need to be performed simultaneously. There's the dishes which show up about every 15 minutes with hungry kids grazing all day. There's grocery shopping and "What's for dinner?" There's yardwork! There's "Dad's Taxi Service" which is on call 24 hours for trips to music lessons, gymnastics, sports practices, as well as the other necessities of life like the dentist, orthodontist, haircuts, etc. And of course the unexpected tasks; "Dad kitty just coughed up a hair ball" "Dad there's a spider in my room" "Dad I spilt my milk all over my dress and I don't have anything else to wear" "How could you not have anything to wear...I just finished three loads of laundry!!!" What great timing...as soon as I typed that last sentence my daughter came up to me and said "Dad, could you help me find something to wear? I can't find any clean clothes in my room." HA!!! I guess it's back to multi-tasking! My daughter also just said "Oh Dad...just a reminder that today is the day to go pick out fireworks for the 4th of July!" I'll add that to the list!!! P.S. - "Dad...can you help me with my hair?" "I'll be right there sweetie...as soon as I finish this blog post!"